Commercial whaling has been banned worldwide since 1986, but that hasn't stopped Japan's commercial whale hunt. Right now, five vessels — led by a monstrous 8,145-tonne factory ship— are hurtling toward one terrible goal: the illegal slaughter of more than 300 minke whales in the winter waters of Antarctica. Japan seeks to skirt international law, saying its ships are killing whales in the name of "scientific research" that is allowed under the International Convention for the Regulation of Whaling. But whales killed during Japan's "expeditions" are ultimately processed and sold as meat in the country's consumer market. In fact, a 2014 ruling by the International Court of Justice found that Japan's last whale hunt lacked scientific value and violated the ban on commercial whaling. Now Japan's government has reorganized its whaling program, and issued itself another bogus "research" permit to kill whales in Antarctica. We can't let them get away with it. Care2 is calling on United Nations Secretary General António Guterres to take a stand against Japanese whaling — and we need your help to convince him. We're asking the Secretary General to introduce a United Nations resolution imposing economic sanctions on Japan for conducting commercial whale hunts in the Antarctic. With enough signatures from enough countries, we believe we can spur action at the United Nations to end Japan's whale hunts once and for all. Japan's ships may already be killing whales — please sign this urgent petition for whales now. 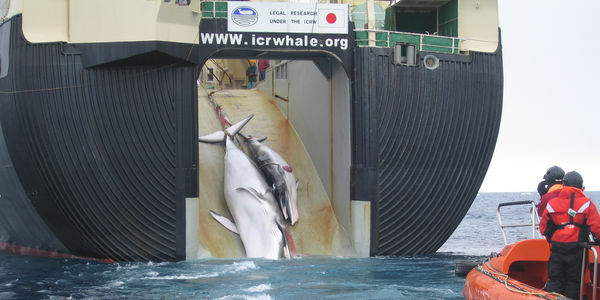 Demand UN sanctions against Japan until it stops killing whales and flouting international law.